We’re proud to bring you the finest-quality Northwest ingredients in our Signature Sweets. 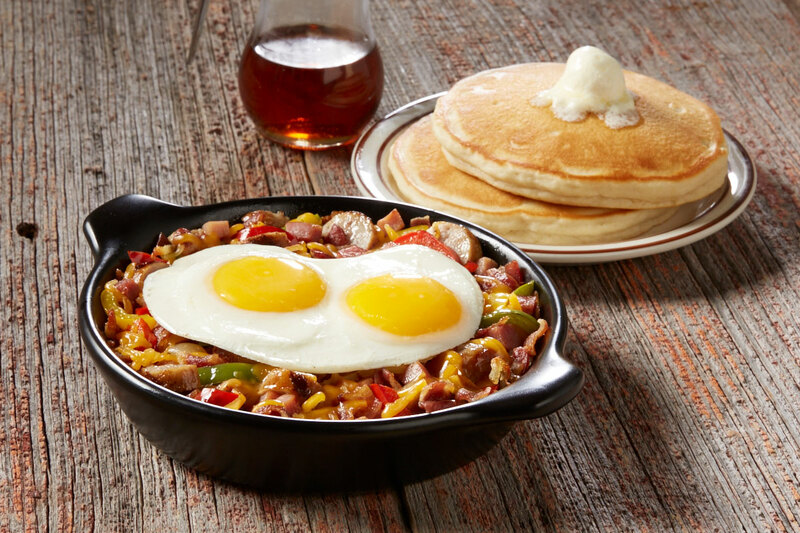 All combos are served with two farm-fresh eggs* and your choice of two strips of Applewood-smoked bacon, two grilled sausages or one Zenner’s ® Double Smoked Sausage. We dip thick slices of bread in our special batter and griddle them to golden perfection. Three fluffy buttermilk pancakes. The best you’ve ever tasted. You’re in for a very special treat. A thick, crispy, yummy waffle made from our own secret recipe. Three slices of fresh-baked cinnamon rolls dipped in egg batter and griddled to golden perfection. Topped with caramel sauce, candied pecans and whipped cream. A Shari’s Original! 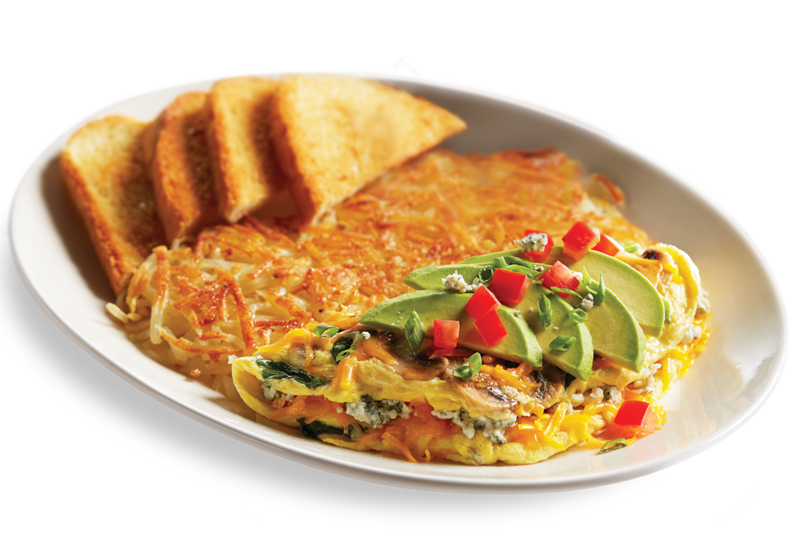 At Shari’s, we don’t like to play favorites, but we’ve built some especially tasty three-egg combinations just for you! Includes your choice of two fluffy buttermilk pancakes, golden French toast, a cracked pepper-cheddar biscuit with savory sausage gravy or hash browns and toast. This one will keep you coming back for more! Wait until you taste this incredible combination, with our locally grown baby spinach, tomatoes, fresh sautéed mushrooms and cheddar cheese topped with sliced avocado, green onions, tomato and bleu cheese crumbles. Our favorite way to enjoy it is omelette-style. You’ll get a kick out of this one. With Applewood-smoked bacon, mushrooms and pepper jack cheese topped with olives and green onions. Just the way our founder liked it! With smoked country ham, peppers, onions and melted cheddar. Select any two items below (included). Then select additional items to craft the perfect omelette or scramble for you! All are served with your choice of two fluffy buttermilk pancakes, golden French toast, a cracked pepper-cheddar biscuit with savory sausage gravy or toast. A Southern treat! Crispy country fried steak smothered in our savory sausage gravy, with two farm-fresh eggs* done your way and crispy golden hash browns. 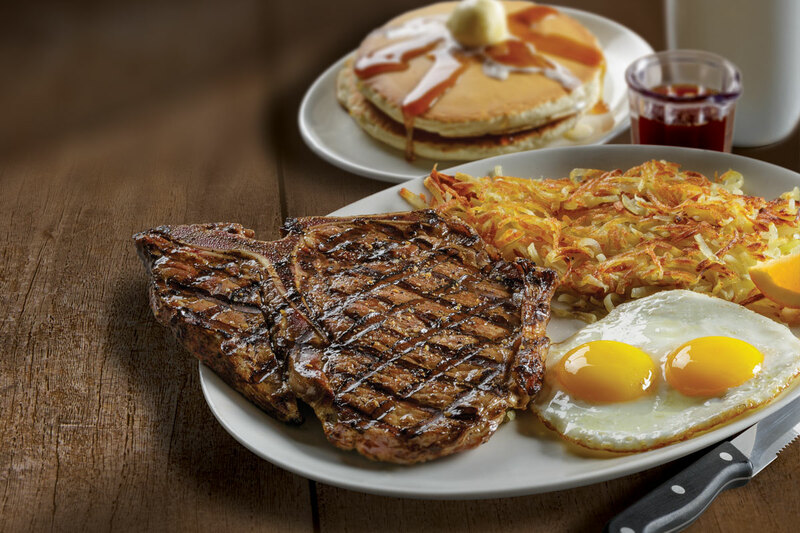 Satisfy your hunger with our tender and juicy 1-pound T-bone steak. * Served with two farm-fresh eggs* done your way and crispy golden hash browns. Nothing tops our mouthwatering top sirloin. 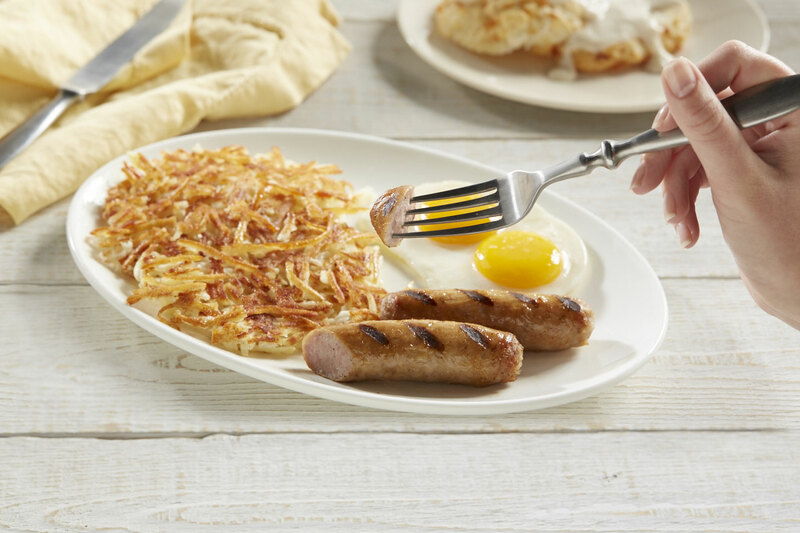 * We cook it as you like it, and add two farm-fresh eggs* done your way and crispy golden hash browns. Breakfast doesn’t get any better than this. Two farm-fresh eggs scrambled with diced country ham and cheddar cheese. Served with two fluffy buttermilk pancakes, crispy golden hash browns, Applewood-smoked bacon and grilled sausage. There’s nothing standard about this breakfast. 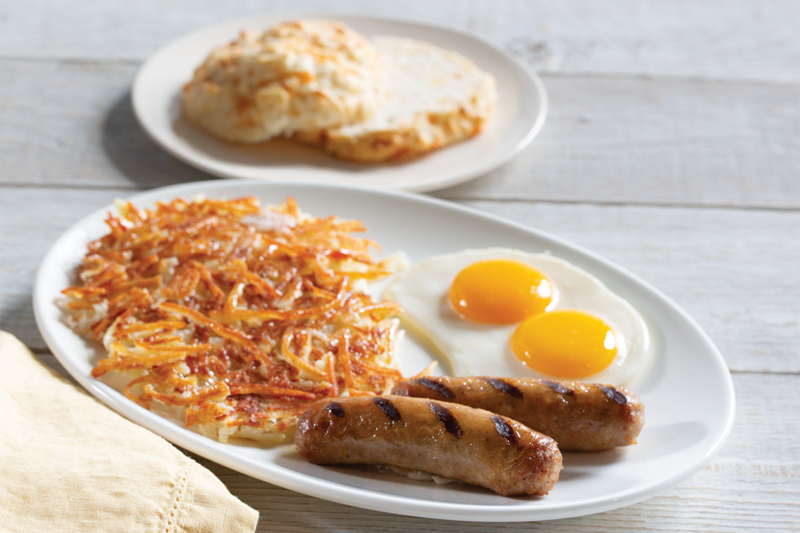 Two farm-fresh eggs* served with your choice of three strips of Applewood-smoked bacon, two grilled sausage links or one Zenner’s ® Double Smoked Sausage. Two farm-fresh poached eggs* and country-sliced ham set atop an English muffin with creamy hollandaise sauce. Tender slices of prime rib on sautéed mushrooms and sweet red onions. 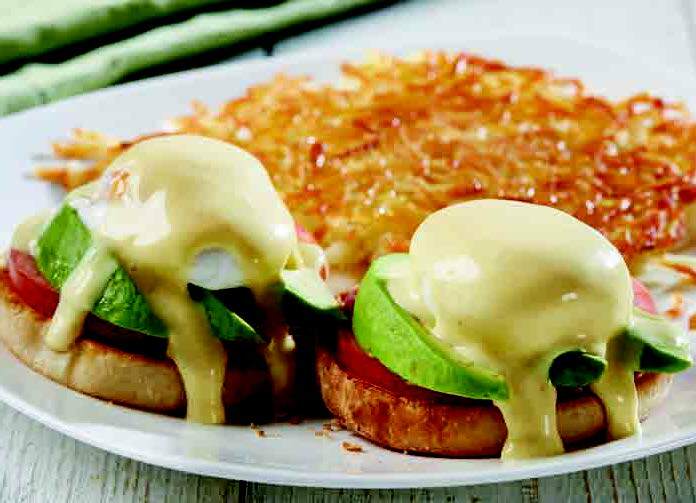 Topped with poached eggs* on an English muffin with Hollandaise sauce and golden hashbrowns. Try this countrified version for a delectable change. Two farm-fresh poached eggs* and hearty grilled sausage set atop a cracked pepper-cheddar biscuit covered in savory sausage gravy. 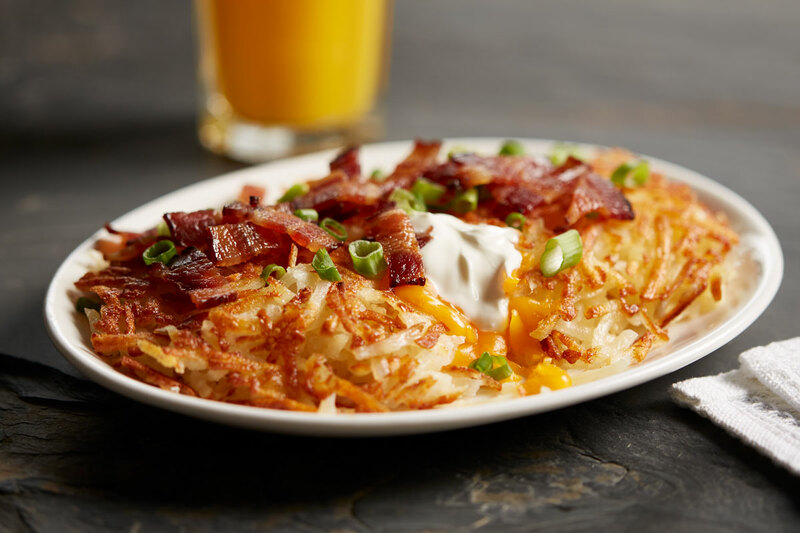 Shari’s signature hash browns stuffed with Tillamook® cheddar, sour cream, bacon and topped with scallions. Fresh-baked cracked pepper-cheddar biscuits and savory sausage gravy. Fresh-baked cracked pepper-cheddar biscuit, English muffin, sourdough, whole wheat, marbled rye or white toast. With sliced banana, candied pecans and 2% milk. More of what you love – cheese! Cheddar, pepper jack and Swiss layered with tender, hand-carved ham on thick-cut parmesan-crusted sourdough griddled to mouthwatering golden deliciousness! A prime rib dip with a Philadelphia accent! Tender slices of prime rib topped with Swiss cheese, mushrooms, grilled onions and peppers, piled high on a crispy, grilled French roll, and served with hot au jus and creamy horseradish. Tender slices of prime rib piled high on a crispy grilled French roll, and served with hot au jus and creamy horseradish. Go with a sure thing! Sliced turkey breast, Applewood-smoked bacon, tomato and lettuce. 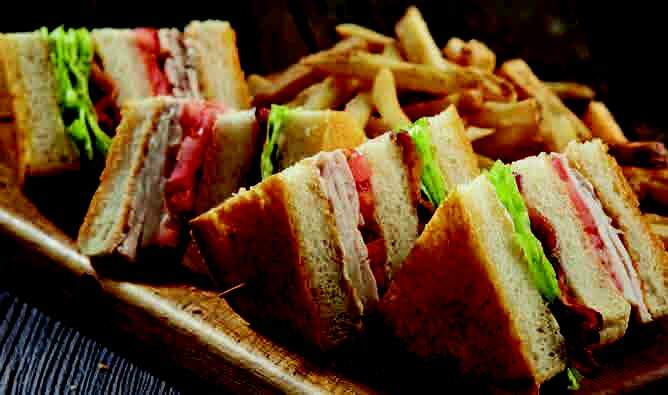 We’ve given the traditional chicken club a kick. Made with tender Cajun-seasoned chicken breast, Applewood-smoked bacon and fresh avocado. With mayo, lettuce and tomato on Texas toast. With Swiss, Tillamook® cheddar and pepper jack cheeses. With mayo, lettuce, red onions and tomatoes on whole wheat. A must-have on a chilly day – or anytime! Hand-carved turkey breast, creamy mashed potatoes and house-made stuffing layered on whole wheat. Topped off with hearty turkey gravy and cranberry sauce. No additional side choices. 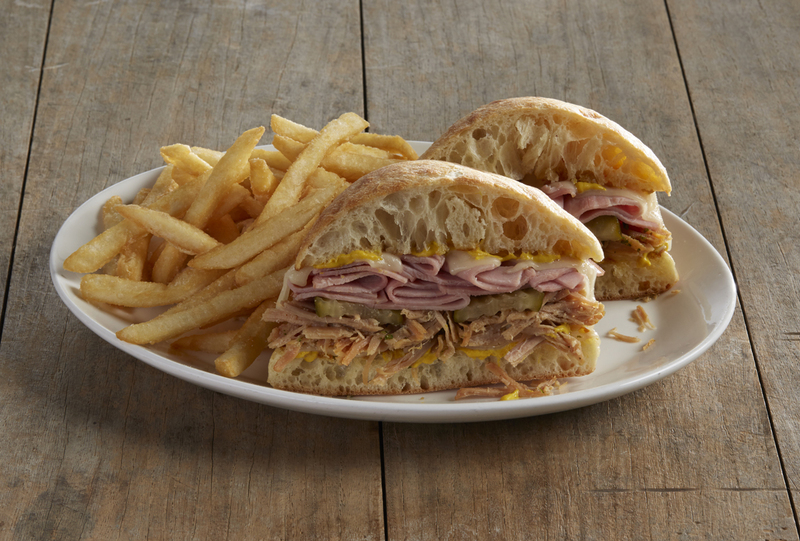 Roasted pulled pork and smoked ham, Swiss cheese, dill pickle chips, served on a toasted ciabatta roll. Grilled chicken breast with cucumbers, tomatoes, olives, red onion, parmesan cheese and croutons. Tossed in Tuscany-inspired vinaigrette. Flame-grilled choice top sirloin* with bleu cheese, toasted pecans, caramelized red onions, field greens and our raspberry vinaigrette. At Shari’s we make the freshest salads you’ve ever tasted. But there is one person who can make them even better – you! give you all the delicious options you need to create one that’s all your own! It all comes together just like you like it! Chilled iceberg lettuce wedges topped with grape tomatoes, red onions, Applewood-smoked bacon, Italian vinaigrette and bleu cheese dressings. Crispy romaine and spring mix with diced tomatoes, green onions, sliced olives, cucumbers, bleu cheese, sliced almonds and crunchy croutons. The Northwest is home to the finest-quality beef and cheese in the world. At Shari’s, we’re proud to bring this bounty to your table. 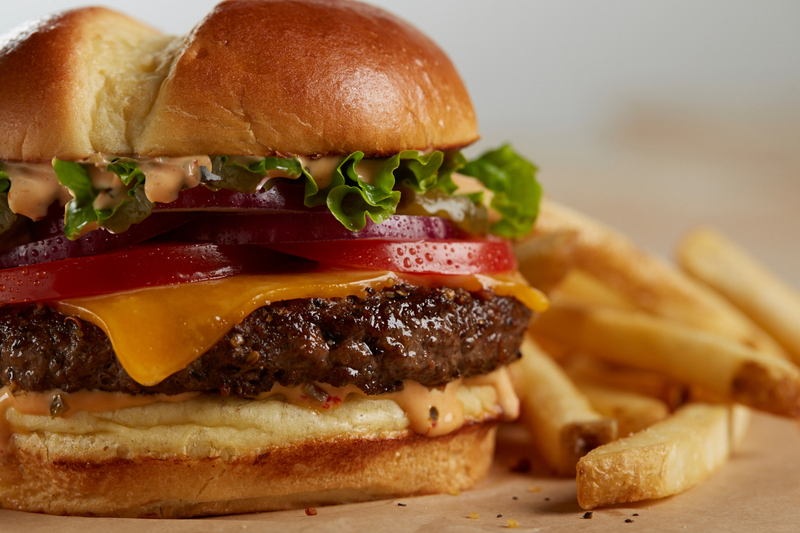 Our Signature Burgers & Melts are made exclusively with fresh, never frozen, premier Double R Ranch® beef from the Okanogan region of north-central Washington. And we proudly serve Tillamook® cheddar from the farmer-owned dairy co-op in Tillamook, Oregon. A juicy beef patty,* cooked to order, with Tillamook® cheddar, fresh lettuce, sliced red onion, tomato and Shari’s special sauce on a grilled split-top potato bun. Double the amazement! Two juicy beef patties,* cooked to order, with Tillamook® cheddar, Applewood-smoked bacon, fresh lettuce, sliced red onion, tomato and Shari’s special sauce on a grilled split-top potato bun. It all adds up to a towering taste of awesomeness. 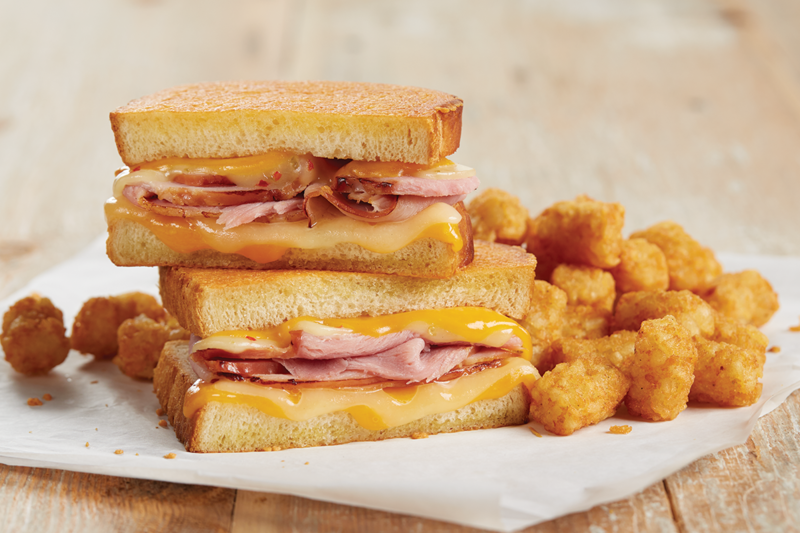 Our melt may be traditional but it’s anything but boring. We start with the freshest beef patty,* Swiss cheese, caramelized onions, and Thousand Island then put it all together between slices of fresh marbled rye griddled to perfection. You won’t find a better bacon and cheddar. Made with a fresh beef patty,* Applewood-smoked bacon, Tillamook® cheddar, caramelized onions and mayonnaise griddled to golden perfection on fresh marbled rye. Why go East when you can go to Shari’s for a tasty Philly-style melt? Made with a fresh beef patty* seasoned to perfection, grilled peppers & onions, melted Swiss and mayo between thick-cut slices of grilled parmesan-crusted sourdough. We load them up so you can share with friends and family. We start with crisp golden tater tots and up the flavor by adding Applewood-smoked bacon, cheddar cheese and green onions, with ranch dressing and tangy BBQ sauce for dipping. Try a little tenderness! Our all-white-meat chicken tenders are lightly fried to a crispy golden brown. Pass them around and enjoy with our creamy ranch and BBQ dipping sauces! It doesn’t get any heartier or tastier than this! Our nachos start with crispy house-made tortilla chips that are topped with tender pulled pork and finished with handcrafted guacamole, pico de gallo, cheddar and pepper jack cheeses, sliced black olives, spicy queso, green onions and a big dollop of fresh sour cream. Pass around the crispy tater tots, crunchy onion tanglers, cheesy mozzarella sticks and all-white-meat chicken tenders. Served with marinara sauce, BBQ sauce and chipotle ranch for dipping. Mozzarella may be Italian, but these are pure Northwest delicious! Enjoy these crispy, melty cheese sticks with our fresh marinara sauce for dipping. 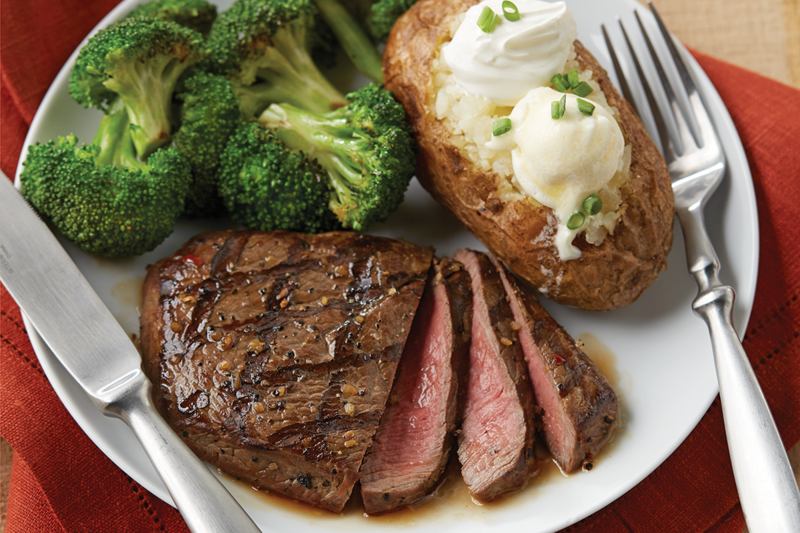 You’ll love Shari’s USDA steaks. They’re flame-grilled to order and always tender, juicy and flavorful. Add soup, salad, Shrimp Skewers or Load up your potato for an additional cost. Our favorite fish done your favorite way! 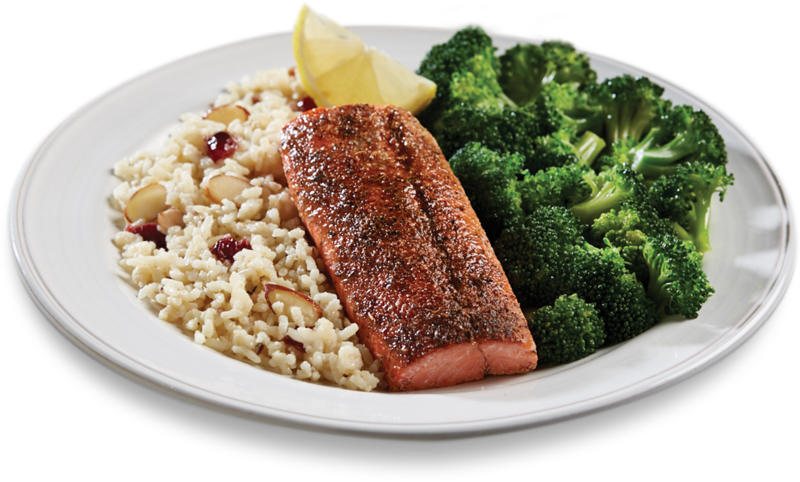 Wild Alaskan salmon fillet seasoned and blackened, or simply grilled, served with fluffy rice pilaf and garden-fresh steamed broccoli. There’s nothing more satisfying than our hand-carved slices of tender turkey breast, hearty mashed potatoes and stuffing topped with hot turkey gravy. Served with garden-fresh steamed broccoli and cranberry sauce. Treat yourself to the best of the South! Tender, homestyle country fried steak smothered in savory sausage gravy and served with creamy mashed potatoes and garden-fresh steamed broccoli. A thick, fresh beef patty,* seasoned and seared to perfection, topped with sautéed fresh mushrooms and caramelized onions then covered in a robust demi-glace. Served with creamy mashed potatoes and garden-fresh steamed broccoli. For Lighter Appetites and our Honored Guests. A farm-fresh egg* and Applewood-smoked bacon or sausage. With your choice of two buttermilk pancakes, French toast or hash browns and toast. Just the way our founder liked it! A two-egg omelette with smoked country ham, peppers and onions and melted cheddar. With your choice of two buttermilk pancakes, French toast or hash browns and toast. 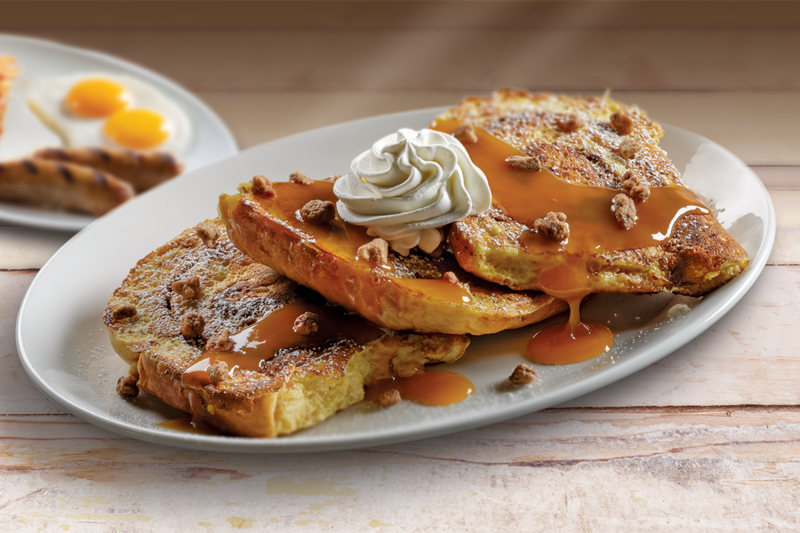 Topped with home-style country gravy and served with one egg. * With your choice of two buttermilk pancakes, French toast or hash browns and toast. Thick slices of Texas toast dipped in our special batter and griddled to golden perfection. Petite iceberg wedge topped with grape tomatoes, red onions, Applewood-smoked bacon and Italian vinaigrette and bleu cheese dressings. 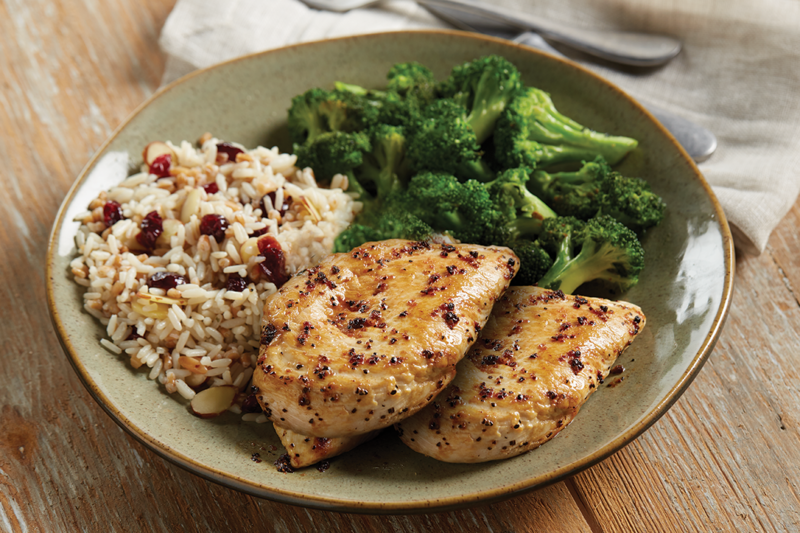 Topped with a grilled chicken breast. Half sandwich paired with a cup of today’s soup (120-290 cal), or garden salad. With mayo, lettuce, red onions and tomatoes on wheat. 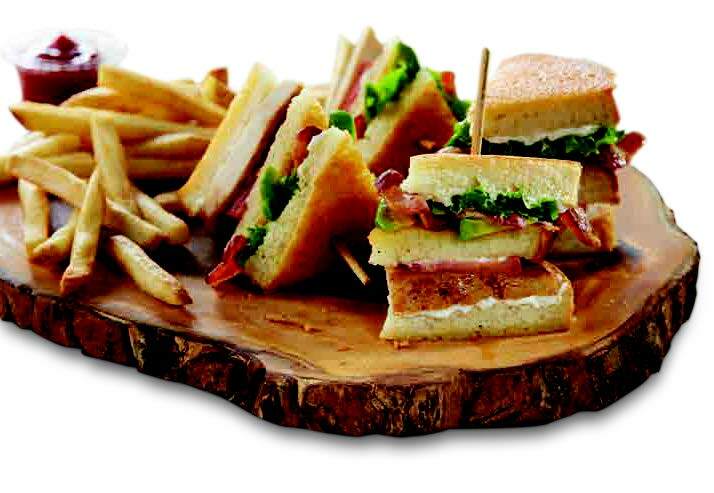 Make your Half Sandwich Duo a Trio! 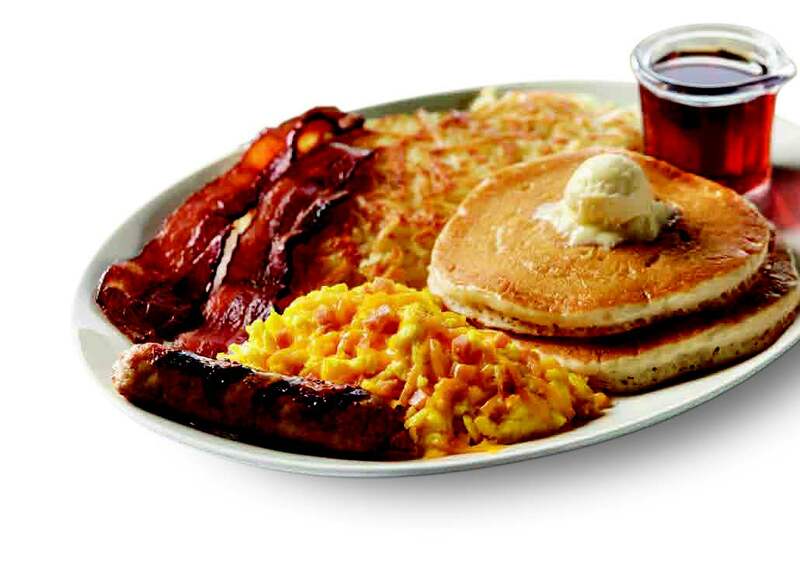 Choose from the following Shari’s favorites. Served with a bakery-fresh dinner roll. A tender, homestyle country fried steak smothered in savory sausage gravy and served with creamy mashed potatoes and garden-fresh steamed broccoli. The best of the Northwest! Hand-cut, beer-battered cod fillet lightly fried and crispy. With house-made coleslaw, tartar sauce and Shari’s long-cut fries or tater tots. Hand-carved slices of tender turkey breast, hearty mashed potatoes and stuffing topped with hot turkey gravy. Served with garden-fresh steamed broccoli and cranberry sauce. Shari’s attempts to provide nutrition and ingredient information that is as complete as possible but due to product preparation and portion size variations this information can only be viewed as approximate and not exact. The nutrition analysis is compiled from data provided by product suppliers and manufacturers for ingredients furnished to Shari’s in their precooked form. Although we believe these sources to be reliable, we cannot guaranty the accuracy of the product information provided to us. While the ingredient information is based on standard product formulations, variations may occur depending on the local supplier, the region of the country and the season of the year. available at all restaurants. Test products, test formulations or regional items have not been included. *Department of Public Health Notice: Meats or eggs that are undercooked to your specifications may increase your risk of foodborne illness, especially if you have certain medical conditions.